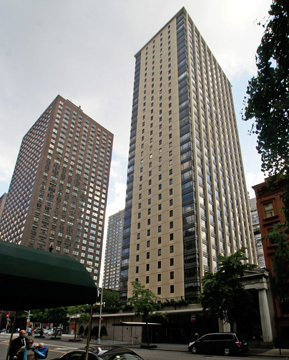 One of the first major projects designed by Richard Roth Jr., one of the "sons" in the famous architectural firm of Emery Roth & Sons, Tower East was a radical departure from traditional high-rise apartment building design in New York. Initiated just before the 1961 Zoning Resolution that promoted the use of plazas to provide more public space and also permit taller buildings that did not fully occupy their sites, this tower became a prototype for many others, especially to the south on Third Avenue: a tall tower set on a low-rise base. Unlike the Seagram Building on Park Avenue that actually created a large public plaza and was highly influential in the rationale for much of the new zoning in 1961, this handsome tower does not provide street-level public space, but its freestanding tower, setback from the base on all sides, does provide considerably more "light and air" to its surroundings (as well as casting a longer shadow). 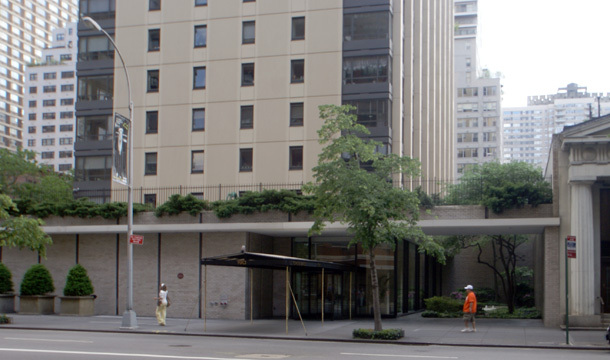 The 34-story, 132-unit cooperative apartment tower is quite distinguished and far more attractive than the previous generation's minimal "white brick monstrosities." With its bronze-color window sashes and dark-tinted picture windows and its exposed-concrete piers on the east and west facades, it conjures up pin-strip suit snazziness. Interestingly, the north and south facades are treated differently with inset exposed-concrete walls that do not extend to the building's corners. These facades make the building appear somewhat less "commercial" than the east and west facades that could be mistaken for an office building. "Richard Jr. created this building in a conscious effort to break way from the past and delineate a new, modern image for apartment houses. 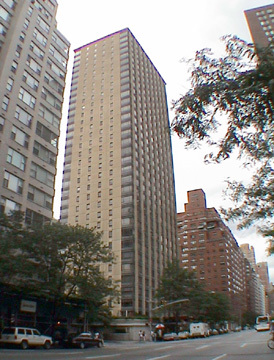 Following the passage of the new zoning ordinance, this type of sheer tower became commonplace all over the city," noted Steven Ruttenbaum in his book, "Mansions in The Clouds, the Skyscraper Palazzi of Emery Roth," (Balsam Press Inc., 1986). 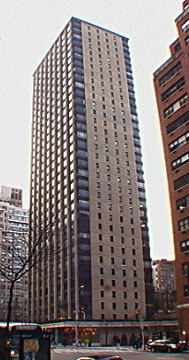 Tower East was built by Tishman Realty & Construction Company. It replaced the Loew's Seventy-Second Street movie palace that had been designed by Thomas Lamb and John Eberson in 1932. The new building has a 500-seat movie theater with an entrance on Third Avenue. There are four apartments per floor and all have quite spacious L-shaped living rooms with two exposures, entrance gallery and a maid's room that doubles as a den off the kitchen. The bathrooms have no windows.